Expand your knowledge on compression – BG Products, Inc. Compression ratio is the volume of space in the combustion chamber from largest to smallest capacity. In internal and external combustion engines, compression is defined as the piston’s movement to squeeze the fuel/air mixture in the cylinder. Most technicians know that peak compression in an engine is necessary to allow an engine to extract the most energy from the fuel/air mixture. An engine’s proper compression ratio allows the right amount of oxygen and fuel molecules into a reduced space (the cylinder) along with heat caused by compression. A given gasoline engine’s compression ratio example can be approximately 9:1, which means 9 units of air into the space of 1 unit. All of these elements working together result in optimum fuel/air mixing to ensure the maximum release of available energy from the fuel source. So, an engine’s proper compression ratio is a good thing. BG Sales Reps know it’s inevitable that every engine will experience a loss of compression. Loss of compression means a cylinder can lose some of its potential fuel/air mixture. Compression loss usually occurs due to improper piston ring sealing (or more rarely head gasket, valve sealing or piston wear). Solutions in the past for restoring compression were labor intensive, time consuming and expensive. It’s a good thing BG’s got a product to restore and maintain peak compression! The main benefit of BG 109 is right there in the name: BG EPR® Engine Performance Restoration®. 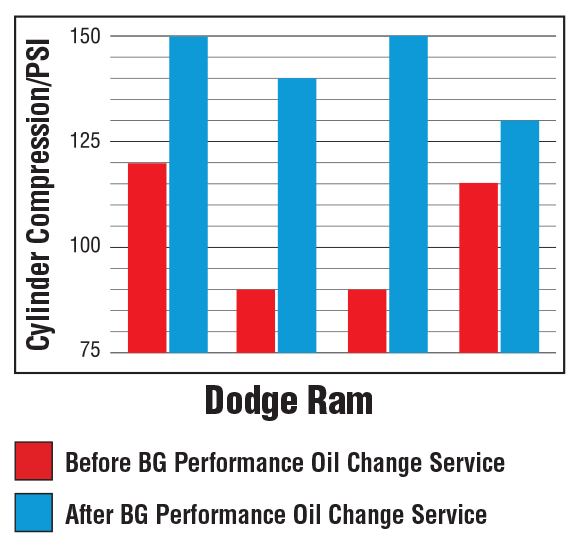 BG EPR® has proven to be a simple and very effective solution to engine compression loss. BG EPR®’s ring-clean technology restores compression by softening, emulsifying and dissolving hard-to-remove deposits that can build in less than 30,000 miles clogging rings and seals. Lab testing has shown benefits with restored performance, reduced emissions and regained MPG from just one oil change using BG EPR®!